Planting corn in the cold could mean low yields and a potentially lethal result for the plants themselves. University of Missouri Extension corn specialist Greg Luce recently recognized that April’s cold start across Missouri and surrounding areas may have limited fieldwork for many producers. 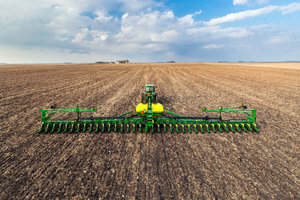 However, he believes that it’s critical for corn planters to remain patient as they wait for warmer soil. “It’s hard to believe, but we’re on pace for experiencing the coldest April on record for Missouri,” notes University of Missouri Extension climatologist Pat Guinan. The existing record was originally set back in April 1907, when the average monthly temperature was 47.2 degrees – eight degrees below normal. Cold air centered over the Hudson Bay has been creating frigid temperatures in the middle part of the U.S. In addition, shots of arctic air have been coming down from Canada. That being said, Luce says there is still “plenty of time to plant corn.” The key is to wait until the soil warms, as planting now would result in low yields. The effects of the cold are the worst when seeds go into soil that’s below 50 degrees Fahrenheit, according to Luce. When it comes to sprouted corn, temperatures around 28-to-32 degrees Fahrenheit can cause damage, but anything below this can be lethal to the plants. In the event of a freeze, Luce says it’s important to wait a few days to look for damage. “Not all freeze injury is lethal,” said the expert. More information on crop planting and April weather delays can be found by visiting the University of Missouri Extension website.